While outside temperatures will always fluctuate, you deserve to be comfortable in your vehicle. Maintain the perfect temperature for you by scheduling auto heating and cooling repair in Raleigh, NC. At Tilden Car Care Center, we offer service options for all makes and models. Whether your heater or AC is broken, count on us to make your system work like new. Turn to us today for an auto AC repair for your car or truck. 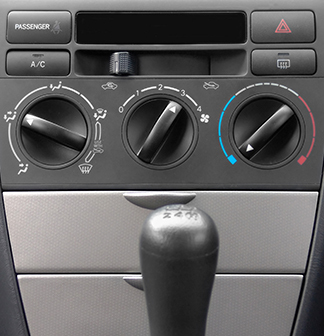 Does your vehicle have 60/40 air conditioning? You know, the type where you drive at 60 mph with your windows 40 percent down while hoping for a cool breeze. If that sounds like your car, truck, or van, then you better do something about it before you melt in the summer sun. It’s never too early to seek out qualified auto AC repair, and it’s never too late, even when sweat is dripping off your nose. It’s not always sweltering, so here’s a scenario you might be familiar with: You get into your car and stare at a frosty windshield. After a few moments with the engine running, you turn on the defroster and wait. Minutes later you’re still waiting and still can’t see. That’s a good sign there’s a problem somewhere in the system. At this point you have a couple of options: get out and scrape away the frost with a credit card or call the pros at Tilden Car Care Center for auto heating repair. If you like having warmth in your vehicle and like being able to see where you’re going, then we’re ready to help. As the temperatures soar, you don’t want to endure the summer heat in a steaming hot car. Instead of sweating your way to and from work, turn to us for a full auto AC repair. We repair any make or model. We perform a full inspection of your temperature control system to determine the source of the issue. Once we discover what is causing the malfunction, we can perform a full fix. For more than 70 years, customers have turned to our technicians to deliver the leading standard of repair service. We have the skills needed to handle every issue and work hard to ensure your situation is taken care of the right way the first time. Winter is cold enough without having to deal with a malfunctioning auto heater. When the freezing temperatures have you reaching for your driving mittens, we are here to help. Stop shivering during your commute, work with us for your auto heating repair services. There are a variety of different things that can go wrong with your heating or cooling system. No matter the cause of the problem, our technicians are happy to perform a full fix. We work quickly and efficiently to repair every component, including clutches, condensers, and compressors. With us on your side, you will not have to deal with the bitter chill of winter while you drive. Don’t listen to complaints of “It’s too cold” or “It’s too hot” whenever you have to take a trip in your car or truck. We know it’s hard to keep everyone happy all the time, but we do our best to keep your passengers calm, cool, and collected by making sure your AC and heating system is in tip-top shape. With the maintenance and repairs that we do on your system, it’s easy to find the Goldilocks Zone of “just right” temperatures. For your peace of mind, keep us in mind when you need auto heating and cooling repair. At Tilden Car Care Center we are prepared to work on any vehicle, so you get the level of comfort expected in a modern vehicle. Your car’s air conditioning system impacts fuel economy as it increases the load on your engine. An engine working harder consumes a bit more gas than one which is operating at a lighter load. Make sure the load is not excessive by having regular auto AC maintenance done at our shop. It’s your money, don’t waste it. Contact us for effective air conditioning and heating repair for your vehicle. We proudly serve clients in Wake Forest, Cary, Apex, Morrisville, and Raleigh, NC.